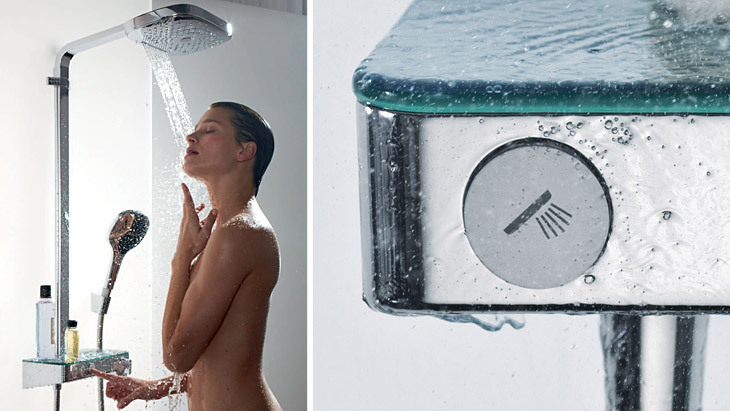 The new Select functions on Hansgrohe's shower systems make them truly impressive. When you recommend the Raindance Select E 300 Showerpipe to your customer, he/she will be faced with a multitude of options for experiencing the ultimate in pleasure and convenience. Overhead shower, hand shower or thermostat: everything is controlled at the simple touch of a button. The unique design makes showering a delight. And the consistently intuitive operating concept even more so. Select buttons on hand shower, overhead shower and ShowerTablet Select 300 make shower and jet selection extremely convenient: invigorating or relaxing rain from the overhead shower – now also with RainStream gush spray – plus three different jet types from the hand shower. This makes showering a captivating experience for all age groups and body sizes. The showerpipe is installed in shower or bath tub in just a few simple steps. It can easily be fitted onto existing wall connections and is the ideal solution for upgrading the bathroom quickly and effectively.. This alluring feel-good product will enhance the homes of your customers. Simple operation with large, clear symbols on the front of the ShowerTablet Select 300 makes the shower system ideal for children, older people and those with limited mobility.